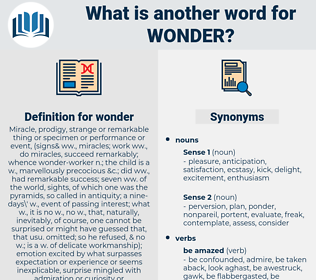 What is another word for wonder? not know what hit you. Sous, miracle, wonderful, amazement, surprise. AM, ask, questions, know, wonderif, consider, understand, think, Learnt, requests. ask, questions, ponder, know, inquire, enquire, consider, surprise, think, speculate, requested, worry, requests. hate, doldrums, execrate, abominate, apathy, ennui, dispiritedness, weariness, restlessness, boredom, abhor, melancholy, weltschmerz, ridicule, contemn, listlessness, dislike, scorn, cheerlessness, detest, tedium, joylessness, unconcern, indifference, tiredness, despise. neglect, answer, reply, believe, know, anticipate, ignore, expect. But I wonder if he knows now how happy I am. ponder, speculate, ruminate, mull over, contemplate, reflect, mull, chew over, think over, excogitate, meditate, muse.